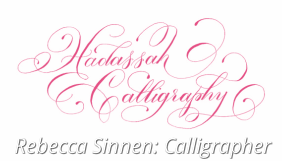 My calligraphic journey began is 2007 when I was searching for a penmanship program for my son's homeschool curriculum. Rather than him picking up the pen, it was me. Once I started, I never looked back. Eventually, friends and family encouraged me to offer my "talent" to others, so in 2014, I opened my etsy store. Since then, I have done work for all sorts of people, including Queen Elizabeth II ! It's been amazing an amazing journey thus far and I can't wait to see--write--whatever comes my way! I love writing, drawing, painting...I enjoy writing a wedding envelope just as much as I do writing a full-scale commissioned painting. To me, they are both a blank canvas deserving my utmost detailed attention. STORY BEHIND THE NAME: Hadassah is the Hebrew name of Queen Esther is the Bible. As a Christian, Esther is one of my favorite accounts. I find comfort knowing God can take a person of humble circumstances and use them for great unbelievable things!